Project obstacles and solutions: The Perpetual Recycling Solutions facility was refurbishing and expanding its back stockyard area at its Richmond, Indiana facility. Perpetual Recycling processes 160 million pounds of RPET plastics per year. This includes curbside waste products, such as water bottles and number 1 recycled plastics. Garmong Construction was hired to do the expansion work during a two week shutdown of the plant. The stockyard had to be completed and ready to handle large rolling equipment when the facility reopened. The paved area covered 2.6 acres. During the two week stretch, the weather changed drastically, from highs in the 80s with sunshine to lows in the 40s with wind and rain. The demands for the volume of concrete and the speed of delivery seemed to change every hour with the weather. Garmong's crews poured up to 300 yards per day to keep the project on schedule. IMI adjusted schedules to get trucks to the site as the demand increased. IMI supplied 2,500 yards of 4,000 psi concrete for this project. 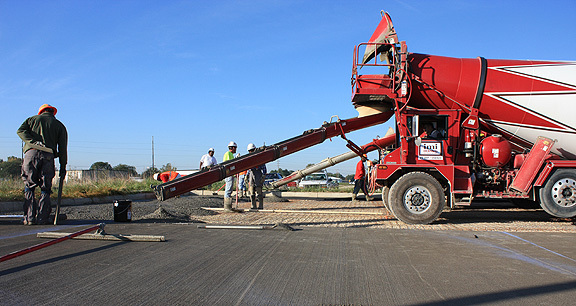 For more information on fast track concrete, contact an IMI sales representative in your area. Click here.